Forests and trees are one of my favorite things to photograph. Their very existence is a display of beauty that we don’t often stop to appreciate or contemplate. Indeed their existence deserves so much more attention, respect and care than we give them. Forests are living, breathing, growing communities, all of them centuries old. Walking in a forest among these beings and all the complex plant life that thrives there, brings my own presence here on earth into perspective. They survive for hundreds of years in all elements, create food from the sun and earth, and experience time on a different plane. We have only recently discovered how they communicate and care for each other, but we don’t yet know how to communicate with them. The layering and overlapping of the celluloid film, alternately brightly overexposed or drenched in oversaturated color, gives these botanical portraits an other-worldly mystique, challenging the viewer to study more closely something so ubiquitous in their lives. 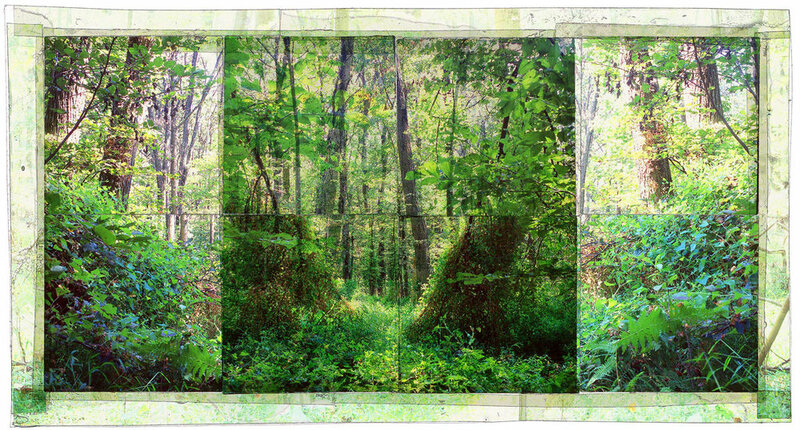 The compositions are framed by images of the forest floor or tree canopy so when presented, the large-scale prints become windows to this world, the one we share with these beings, creating an immersive experience for the viewer.